Apart from its well recognised digestive (mechanical and enzymatic) and absorptive functions, the gut also produces peptides that have autocrine and paracrine as well as endocrine functions. 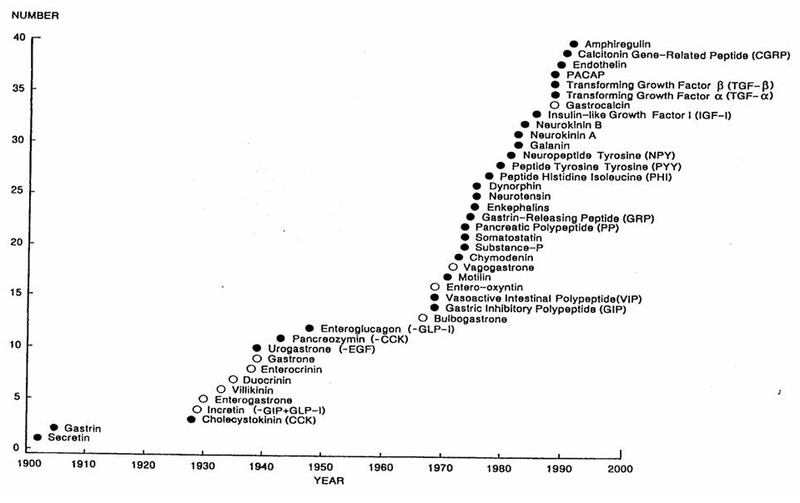 Following on from the description of the first gut hormone in 1902 (secretin), multiple gut-derived hormones have been identified (See Chronology) elevating the status of the gut from a purely alimentary organ to that of the largest endocrine organ in the body, with the adipose tissue being a close second. These gut-derived peptides can facilitate gut growth and development with maintenance of mucosal integrity (e.g. GLP-2), facilitate gut secretions (e.g. Secretin, Cholecystokinin), modulate gut motility (closed-type cells in the gut wall detecting stretch) and signal to the brain regarding presence and absorptive status of nutrients (e.g. Peptide YY, GLP-1); the latter function depending on their location in open-type cells communicating with the gut lumen. They would thus mediate not only the sensory aspects (afferent loop) involving satiety, but also set up an efferent loop bringing about gastrointestinal changes to nutrient ingestion in the form of altered bowel secretions and motility. Thus, a Gut-Brain axis exists which ensures effective regulation of nutrient intake through control of appetite, satiety and absorptive and digestive ability. Despite being named gut hormones based on their initial isolation or local predominance, the presence of these peptides and their synthesis (mRNA expression) may well be demonstrable in various other parts of the body, setting a challenge to researchers to identify the physiological significance of this wider distribution. Peptides secreted from the gut may be detectable in the enteric nervous system and the brain where they function as neuropeptides taking part in neurotransmission and neuromodulation. Multiple peptides synthesised in the gut including CCK, GLP-1, PYY, Ghrelin, Neuromedin B, GRP, and Apo A-IV have all been demonstrable in the brain as well. It is then not surprising that peptide families exist (e.g. secretin-glucagon family; Calcitonin-CGRP family) with multiple members related by their origin (pre-pro-peptides and pro-peptides), producing similar functions at one site and varied actions at another. While similarities in action may be attributable to partial sharing of a aminoacid sequence by peptides or existence of shared receptors, diversity may be explained by tissue-specific translation or production of splice variants as well as variable affinity, specificity, polymorphisms and distribution of receptors. Receptor affinities may be further altered by RAMP (receptor activity modifying proteins), which enables the body to perform diverse actions with fewer receptor types. The same peptide may elicit one response when administered centrally and another response peripherally. (e.g. PYY produces increased appetite on central administration, but satiety on peripheral injection). On the other hand, peptides that are not normally present in the brain might elicit similar actions as in the periphery when injected centrally, suggesting the access of these hormones to the brain physiologically by mechanisms that circumvent the blood brain barrier. (e.g. insulin, amylin, leptin) Elucidation of these characteristics is crucial and a lack of it often restricts our total comprehension of the exact physiological role of many hormones and their interactions at this point in time. While I have made every effort to include all hormones related to obesity here, a non-inclusion here does not rule out the possibility of as-yet-undescribed actions of those hormones. An overview of gut hormone physiology and actions are provided at the bottom of this page for quick reference and comparison. Hope you find it informative and fun!